Everyone remembers where they were on 9/11. It was a catastrophic day. Seldom though, do we think about what happened to the rest of the planes in the sky after planes crashed into the World Trade Center Towers, the Pentagon and a field near Shanksville, PA. At 9:42 am, the Federal Aviation Administration grounded all civilian aircraft within the continental U.S., and civilian aircraft already in flight were told to land immediately. All international civilian aircraft were either turned back or redirected to airports in Canada or Mexico, and were banned from landing on United States Territory for three days. When the United States shut down its airspace, tiny Gander International Airport in Newfoundland opened its runways, taking in 38 wide-body planes on transatlantic routes. A town of about 10,000 people, with one hotel, took in nearly 7,000 passengers from more than 100 countries. They made sure that the people, dogs, cats, and apes that were on board the planes forced to land in Gander, had food, prescriptions, bedding, clothing, toothbrushes, shower facilities and a place to sleep for several days. 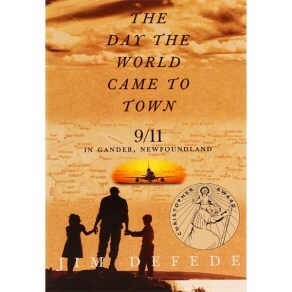 Through interviews and research, Jim Defede shares with us the true story of the incredible acts of bravery, kindness, compassion and comfort that the people of Gander shared with those stranded passengers. A day that was filled with so much terror and grief can also be looked upon as a day that humans were at their best in a small town in Newfoundland.